Expert Sleepers presents Silent Way, a suite of plug-ins designed for use as part of a modular analogue synthesiser system. The plug-ins produce no sound themselves, nor do they process sound - rather, they generate signals to be used as control voltages (CVs), which can be patched into the control inputs of oscillators, filters, VCAs, etc. of an analogue system. There are currently two plug-ins in the Silent Way suite - Silent Way DC and Silent Way Voice Controller. These are described in more detail below. It is anticipated that more plug-ins will be added to the suite in the future - watch the website for product announcements. • Full MIDI and OSC control. • Sample-accurate handling of MIDI note messages. Silent Way DC is a simple plug-in that generates constant output signals. It is intended to be used in conjunction with parameter automation (via MIDI or directly by the host application) to generate varying signals. For example, you could use it as an LFO where you draw out the LFO waveform in your host's parameter automation GUI. 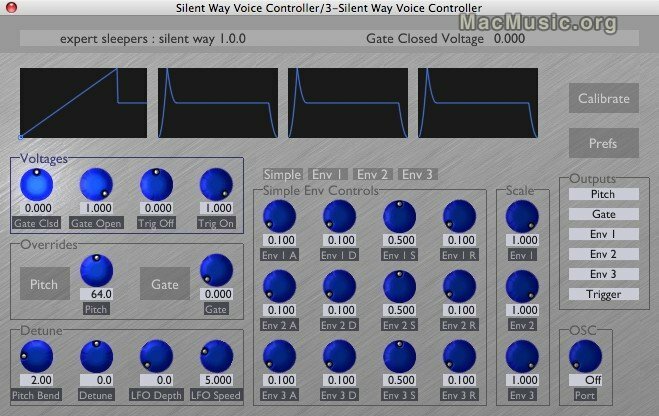 Silent Way Voice Controller is a virtual instrument plug-in designed to directly control an analogue synthesiser by generating the appropriate CV and gate signals via an appropriate audio interface. By listening to the synthesiser's output signal, the plug-in is able to calibrate itself to generate the appropriate pitch CV for the incoming MIDI notes. As well as the basic pitch and gate signals, the plug-in can generate three multi-stage envelope CVs which you can feed to VCAs, VCFs, etc. in your synth. Silent Way is available for both Mac OS X and Windows in VST and AU formats at a price of $49.